The death toll from record downpours in Japan jumped to at least 20, with more than 1.9 million people ordered to evacuate on Saturday, as heavy rain continued to strike large areas in the west of the country. Intense rainfall triggered huge landslides and flash floods in Hiroshima, Okayama, Kyoto and other regions, while hampering rescue operations with dozens of people reportedly missing. Local authorities said a total of 20 people were killed in rain-related accidents, while public broadcaster NHK said the death toll had risen to 38 with 50 others unaccounted for. “The number of casualties is expected to increase as we are still in the middle of collecting information,” Yoshinobu Katsuura, a disaster management official of Ehime prefecture, told AFP. In Hiroshima, the body of a man in his 60s was found near a bridge early Saturday and another man was killed when a mudslide struck his house, a local government official said. 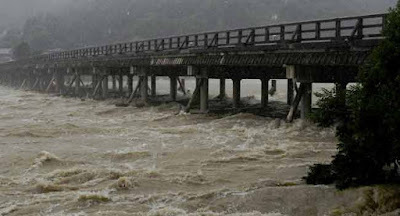 A 52-year-old woman in Kyoto was found dead by a river on Friday, while in neighbouring Hyogo prefecture a construction worker was swept away by flood waters and died. Television footage showed a wooden bridge being washed away in Hiroshima by a rain-swollen muddy river. Rescue workers dug into the dirt as landslides crushed houses in the same region, while several people evacuated to their rooftops as floods swamped entire residential areas in part of the Okayama region. Some areas have been hit by more than a metre of rainfall, according to the government, while around 48,000 troops, police and firefighters have been deployed for rescue operations, Chief Cabinet Secretary Yoshihide Suga said. The Japan Meteorological Agency upgraded its alert system to the highest level — only issued when the amount of rain is expected to be the highest in decades — in large areas of western Japan, while lifting the warning in other regions. Agency official Minako Sakurai told reporters heavy rain was forecast to continue until Sunday in western and eastern Japan.